Build on 2x 48x48 (footballfield). Can be seperated in 2 pieces. 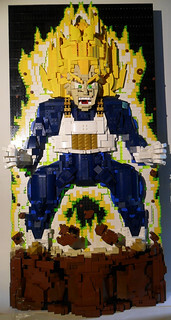 I always liked DBZ as a kid, and liked Vegeta the most of the bunch he had the most of character!!! My intention was a 2D/3D look and making the awesome flames blacklighted!! This is my 4th WIP in May ’16 (yes I made my goal)! Check out my album to see all the stages of this build! !